A vast canyon burrowing between the Kouroupis and Xiro Oros mountains, the Kourtaliotiko Gorge is among Crete’s most dramatic natural attractions – running for almost 3 km along the Kourtaliotiko River. Starting out from the village of Koxare, the scenic canyon winds through the cliffs to join the Libyan Sea coast, where it forms a glistening lagoon fringed by the sandy beaches and verdant palm forests of the Preveli Palm Beach. 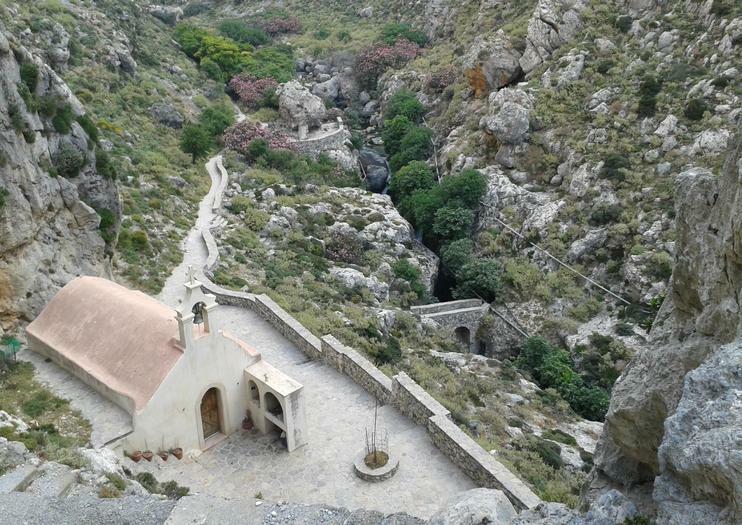 Most visitors choose to follow the road along the top of the canyon, enjoying the views over Kourtaliotiko Gorge and stopping to clamber down into the gorge and explore the many caves, streams and waterfalls, as well as the historic Church of St. Nicholas, perched on the hillside. Kourtaliotiko Gorge is located 22 km south of Rethymnon in central Crete. Swap Crete’s beaches for a 4x4 safari through the beautiful Cretan countryside with this full-day tour. Climb into a 4-seater, all-terrain vehicle and set off in a convoy behind two professional guides. Rumble along Crete’s dusty dirt tracks, passing sleepy, whitewashed villages and verdant vineyards. Visit the pretty village of Spili and enjoy lunch at a local taverna, then continue to Preveli Palm Beach, where you’ll enjoy free time to sunbathe, swim and relax. Cap your tour with an off-ride ride by Kourtaliotiko Gorge. In one day you have a chance to explore Rethymno region highlights from North to South! During this tour you will visit beautiful Cretan village Spili, then enjoy a route along Kourtalioti gorge by car, where we recommend to stop for an easy walk and visit St.Nicholas Church. Then, you will reach the South coast and admire beautiful view of Preveli beach. You can visit the Preveli monastery and go down by stairs up to the beach to swim and walk in the virgin Palm Forest. Finally, you will explore the picturesque Rethymno town and have a lunch in the old town.Our professional guides will give you all the information about the route and advise you about the best activities, restaurants and must-see spots. It is a private tour, so it is up to you, how much time to spend at each destination, the program is flexible. Tell us about your preferences and we will adopt the program for your needs. We give you options, you choose! Book now and discover Rethymno region with Status MLB!